Our mountain farm Gådavallen is a farm used for seasonal pasture and the buildings are from the 1600s. Gådavallen is located in an enchanting idyll deep in the forests of Hälsingland. Here you will experience a tranquil environment with grazing animals on your doorstep. You can fall asleep to the crackling fire from the stove with the grazing animals’ bells and birds chirping in the background. Most of Gådavallen is preserved from the time when the seasonal pasture holding was in use from the 1600s to World War II. Here animals still graze like they did in old times. They are released into the woods during daytime to graze and in the evening they will be coming home. Lodging occurs in our cozy cabin. There is a wood stove, gas stove, 12 volt lights powered by solar, sink and outhouse. Fresh drinking water will be retrieved from the spring. Gas and wood are in place. Mountain farms formerly was used during the summer months as a gathering place for sheep, goats and cows. At this seasonal pasture the animlas grazed in the forest. The animals grazed freely in the woods or someone herded them. There was always people on the pasture farm that took care of the animals and the products they gave. 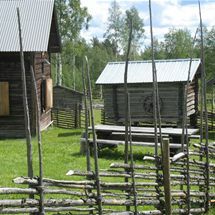 The summer mountain farms is a cultural heritage in Sweden.